The seeds of every success story lie in just one moment – the click moment. It is the moment when that brilliant idea strikes! Vertoz’s Founder & Chairman, Hiren Shah, shares his click moment, in his recent interaction with Mint. Here are a few excerpts. In 2012, the advertising industry was facing certain problems, both on advertiser as well as the publisher side. It was then that Hiren co-founded Vertoz, along with his brother Ashish Shah. The company was founded with the purpose of connecting advertisers with relevant publishers all across the world. 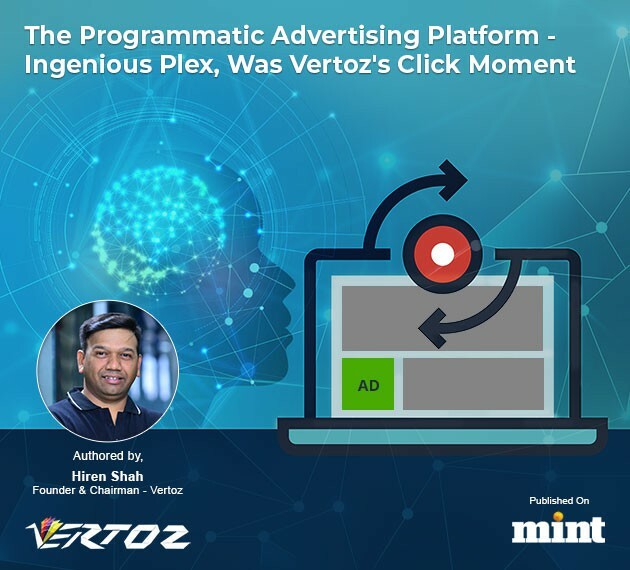 As it further matured as an ad network, the team realized the importance of a data-driven approach, the pivotal role it played in driving better campaign performance and how that would help Vertoz connect advertisers better, with the right customers at the right time. This led to the development of Ingenious Plex, the programmatic platform, in 2014. A “click moment”, which led the duo, Hiren & Ashish, and Vertoz, to scale great heights and achieve success. It created a world of a difference in the Indian advertising scenario, and significantly improved the campaign performance, driving better results and maximizing the ROI. To know further, click here!